Peptide (C)KQFKTSYEKRSFK, corresponding to amino acids 188-200 of rat EAAT1 (Accession P24942). 2nd extracellular loop. Homology Mouse - identical; human 12/13 amino acid residues identical. Antibody concentration after reconstitution 0.4 mg/ml. 1,2. Anti-EAAT1 (GLAST) (extracellular) Antibody (#AGC-021) (1:500). 3,4. Anti-EAAT1 (GLAST) (extracellular) Antibody, preincubated with the control peptide antigen. Immunohistochemical staining was performed in perfusion-fixed free floating rat brain sections (frozen) using Anti-EAAT1 (GLAST) (extracellular) Antibody (#AGC-021), (1:100). 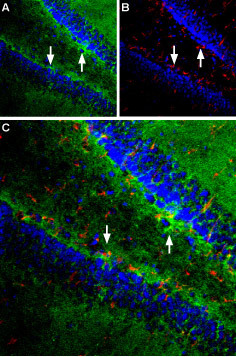 A. EAAT1 staining (green) is particularly intense along the subgranular layer (arrows). B. Staining with mouse anti glial fibrillary acidic protein (red). C. Merged picture confirms presence of densely packed astrocytes along the subgranular layer. DAPI is used as a general cell marker (blue). Cell surface detection of EAAT1 in live intact human U-87 MG glioblastoma cells. A. Extracellular staining of cells using Anti-EAAT1 (GLAST) (extracellular) Antibody (#AGC-021), (1:100) followed by goat anti-rabbit-Alexa-Fluor-594 secondary antibody (red). B. Live image of the cells. C. Merge of A and B. The EAAT family includes five members (EAAT1-EAAT5) that are members of the solute carrier family 1 (SLC1) of sodium-dependent transporters that also includes the neutral amino acid transporters ASCT1 and ASCT2. EAAT1 as well as EAAT2, is expressed predominantly in glia cells (hence its original name: glial glutamate transporter or GLAST), while EAAT3, EAAT4 and EAAT5 are mostly expressed in neurons. Anti-EAAT1 (GLAST) (extracellular) Antibody (#AGC-021) is a highly specific antibody directed against an epitope of rat Excitatory amino acid transporter 1. The antibody can be used in western blot, immunohistochemistry and live cell imaging applications. It has been designed to recognize EAAT1 from rat, human and mouse samples.